"I noticed a weird movement out of the corner of my eye." Maxim Tiseyko was walking near his home in Ukraine a few weeks back when he spotted something that, at first glance, didn't seem all that unusual. 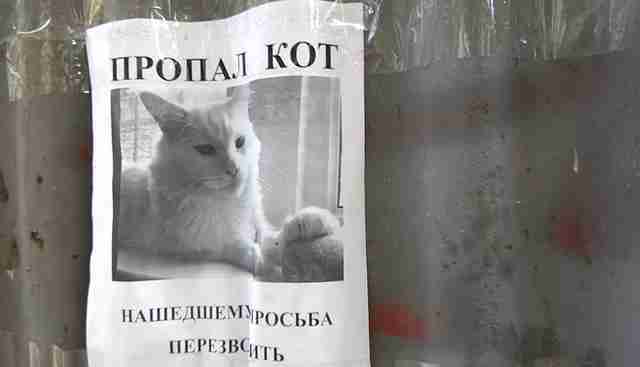 There, taped to the side of a garage, was a poster of a missing cat. But there was actually something quite remarkable about this "lost pet" sign. Tiseyko had been deep in thought about other things at the time, and may very well have failed to give the poster a second look — but the kitty printed on it refused to be ignored. "Suddenly, I noticed a weird movement out of the corner of my eye," Tiseyko told The Dodo. "I stopped, looked closer and thought, 'I probably imagined that.' But then I moved forward and the thing followed me, blowing my brain!" Turns out, the poster had been pasted up in such a way on the corrugated metal siding as to create an accidental optical illusion. It appeared as though that cat was turning his head as Tiseyko shifted his perspective. He decided to take a video capturing that mind-boggling trick of the eye. It's possible that the cat has already been found and is home safe, but if not, the chances of someone recognizing him have never been better — all thanks to that lucky illusion. Tiseyko's video of the poster has gone viral, having been viewed nearly a million times online. It's also been given coverage on news stations across Ukraine. And with any luck, all that exposure will result in a happy ending for the cat. It's certainly motivated Tiseyko. "I'm determined to look for the fellow now," he said.